One of the greatest assets to any iOS device is the ability to listen to your favorite music, audiobooks, or your favorite apps. There is nothing more annoying than trying to do so with earphones that simply ruin the experience with their shoddy qualities. Most of us aren’t in the market for expensive earphones that can cost over $200, so what’s out there for those of us who want to find a balance between sound quality and cost? V-Moda and Arctic each have earphones in their lineups that try to reach such a balance. How do they compare? V-Moda’s Remix Remote earphones are a fine example of the quality that can go into a product when the people who make it care about the user experience. 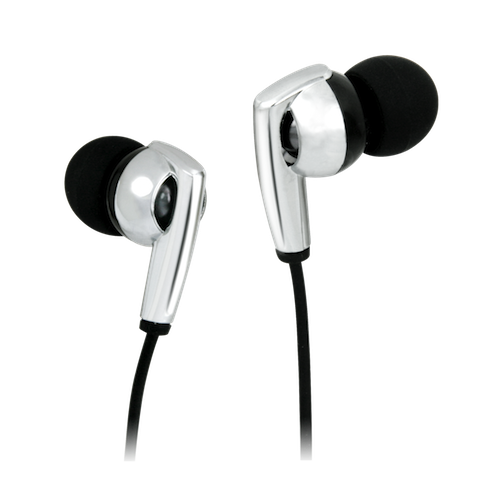 The earphones feature an all-metal, yet lightweight construction that feels solid. In my testing I have never felt like the earphones would be easily damaged. This is an important consideration when using earbuds while working out at the gym or when taking them on a run. 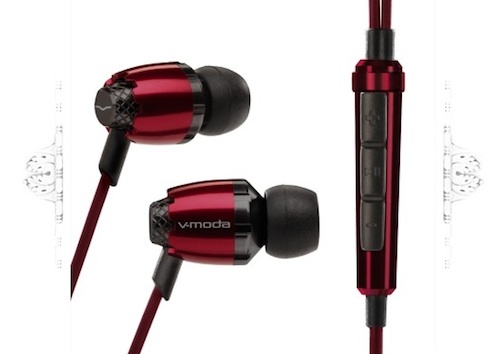 Even the y-connector is made of metal, and the Kevlar-reinforced cables are three to ten times stronger than most other earphone cables, according to V-Moda’s website . The V-Moda Remix Remote earphones also come with detachable ear hooks to help keep your earphones where they belong when you’re working out — in your ears. The medical-grade soft silicone ear inserts are provided in four sizes; extra-small, small, medium, and large. I have found the earphones to be extremely comfortable, even after wearing them for extended periods of up to two hours. I really enjoy the Remix Remote’s namesake — the metallic three-button remote that forms the y-connector of the earphones. Having the remote at the y-connector gives the impression of a more solid construction, unlike the traditional placement of the remote inline along one of the earbud’s cables. The Remix Remote’s three-buttons control volume and starting/stopping your music playback. 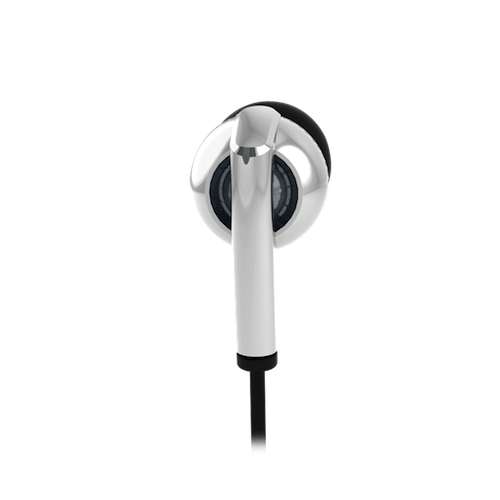 The omnidirectional high-fidelity microphone provides great sound quality during phone calls or when using Siri on an iPhone 4S. 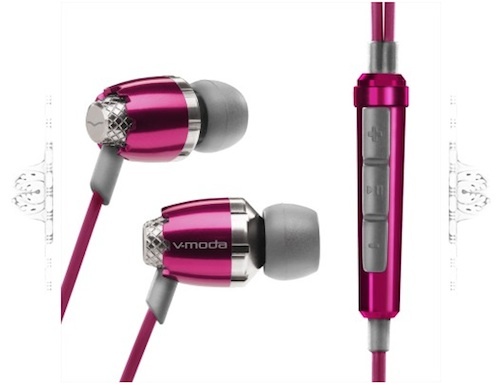 The sound from V-Moda’s Remix Remote earphones is simply awesome. The sound rivals that of many much pricier earphones. This is partially due to V-Moda’s use of 9mm neodymium rare earth magnets in its newly tuned V-MASQUE high definition driver. This helps provide a balanced frequency response from 5Hz – 24kHz. If you’re into the experience of a live concert or sound stage, you’re going to like the V-PORT air flow system that’s built into the earphones as well. Another great feature, V-Moda’s BLISS (Bass Level Isolating Soft Silicone) noise-isolating system, helps remove unwanted outside distractions and enhances the bass quality. Perhaps one of the best features of the V-Moda Remix Remote is the often overlooked warranty. V-Moda provides a generous 2-year V-Moda Premier Warranty and an Immortal Life Program for those of you that are particularly rough on your equipment. Just by calling a toll-free number, you can get a replacement product for 50% off, and, according to the website, maybe even a free surprise. Overall, I find the V-Moda Remix Remote earphones to be a great balance of value and sound quality. They offer solid craftsmanship at an affordable price and a sound quality that matches or exceeds that of many higher-priced earphones. At less than half the price of the V-Moda Remix Remote earphones, Arctic’s E461-BM earphones offer an option for those for whom even greater affordability is a bigger consideration. Don’t be fooled by the E461’s lower price, for they still offer great sound that approaches that of the Remix Remote. The build-quality of the Arctic E461-BM earphones doesn’t quite meet that of the V-Moda Remix Remote’s, but it’s still quite good. The 1.3mm audio cables connect to lightweight, hardened aluminum capsules that utilize neodymium magnets in the sound drivers. This helps to increase sound clarity and provides a lower bass response. The E461’s frequency response ranges from 17Hz – 26kHz, which doesn’t reach quite as low as the V-Moda Remix Remote’s impressive 5Hz. I am pleasantly surprised at just how rich the E461’s sound is nonetheless. While listening to music, it’s hard not to notice the deep bass these earphones provide. The inline remote of the Arctic E461-BM earphones is a bit more limited than that of the V-Moda Remix Remote earphones. Made of plastic, it offers a single push-to-talk button and a microphone. The built-in 3.5mm TRRS plug will allow the microphone to work with any iOS device, but to get the microphone working with your PC or laptop, you’ll have to use the provided adapter cable. 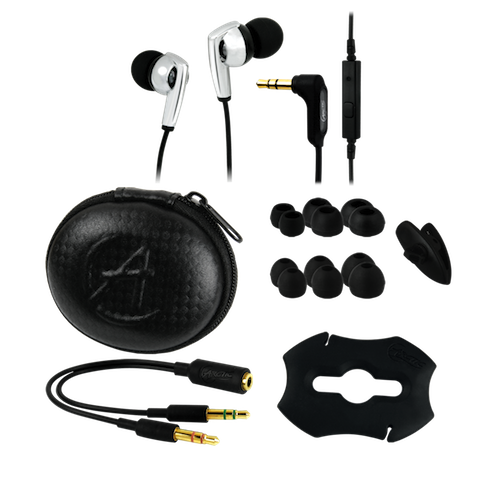 The silicone earbud inserts provided with the Arctic E461-BM earphones are very comfortable and are provided in three sizes; small, medium, and large. They also come with a great case that fits in the palm of your hand. The convenient cable tender keeps your earphones neatly stored too. The V-Moda Remix Remote earphones offer a superior build-quality and slightly better sound performance than the Arctic E461-BM earphones, but they do so at over twice the price. As a consumer, you have to weigh your options. If price is your biggest consideration, then you won’t be disappointed with the E461’s. They offer great sound for a price that won’t hurt your wallet. If you’re rougher on your equipment, then the Remix Remote is probably your better choice, albeit with a higher price-tag. Either way, the sound experience with both choices is quite good and you’ll feel good about your decision.